What Is Dreams of Recovery? The Cindy Donald Dreams of Recovery Foundation, Inc. is a non-profit 501 (c) (3) charitable organization formed in February, 2008. It was founded by Cindy Donald, the charter member, Officers and Directors listed on this website, and numerous devoted individuals from the community. 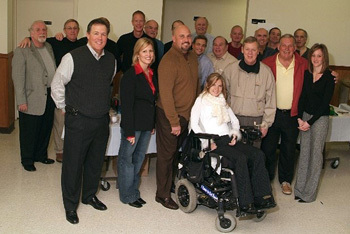 They all share the common goal of seeking Dreams of Recovery for Cindy and all the many others who have suffered the devastating effects of paralysis due to spinal cord and/or brain injuries. Dreams of Recovery focus is on the lives of individuals with spinal cord and brain injuries in granting financial support for individuals to participate in approved therapy programs which are not covered by insurance. As of 2018, we have included the support for facilities that share our same goal of supporting the community for SCI and ABI. Dreams of Recovery strives to help individuals receive the therapy they so desperately need to promote nerve regeneration and gain muscle mass. Through knowledge and experience, the foundation is dedicated to promoting awareness and need for funding of scientific research to find a cure for paralysis. This organization will be funded by the generosity of individual donations, multiple fundraisers, corporate sponsors, and philanthropic foundation grants. We greatly appreciate all donations, volunteers, and new ideas that contribute to the success of this organization. Please join us in making these individuals' dreams of recovery turn into reality. On behalf of The Cindy Donald Dreams of Recovery Foundation and my family, I would like to personally thank everyone for their time, support, enthusiasm, dedication, and passion that help make the foundation such a success. Your generosity is not just about the money, it is so much more; it's about the emotional kindness and the strength you have given by believing in me.